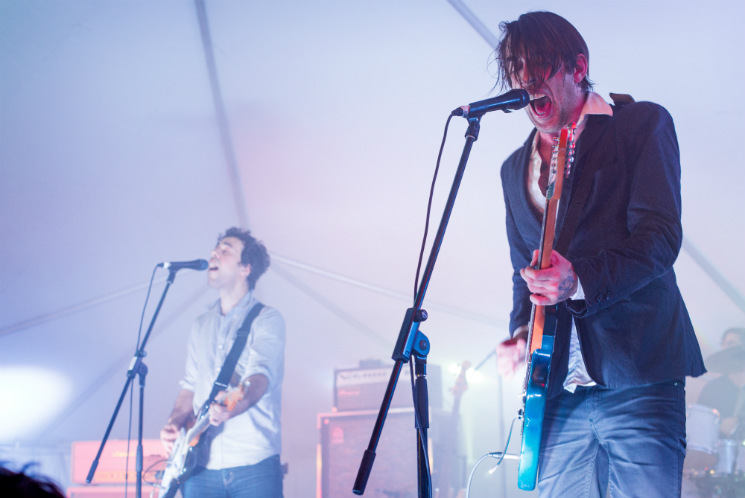 Following a successful run of reunion residencies in New York, Toronto and London, Montreal indie rock legends Wolf Parade headed east of their hometown to close out the inaugural edition of Halifax's Gridlock Festival. Wrapping up a phenomenal weekend, the band lifted any spirits that were still (literally) dampened by the relentless rain, replacing weather-related chills with the kind that any good show should give you. The Haligonian crowd seemed especially hungry, and fairly so, since the band only visited the city once during their initial run. Apparently intent on making up for lost time, Wolf Parade sounded rejuvenated and jubilant, their angular indie rock loaded with nostalgia but still exciting and bristling with electric tension. Harkening back to the glories of the early 2000s, Dan Boeckner, Spencer Krug, Dante DeCaro and Arlen Thompson churned out old favourites like opener "It's a Curse," "Modern World," "Shine a Light" (which was requested again afterwards by either an especially late or especially drunk fan) and "Fancy Claps" (which incited mayhem in the audience as the band kicked it up to dangerous speeds). The material from this year's EP 4 didn't go unappreciated, either, though. "C'est La Vie Way" and "Floating World" were presented as a medley, followed by "Mr. Startup." The converging musical personalities of primary songsmiths Boeckner and Krug may have played a major role in the group's implosion, but it's their differences in perspective and style that make Wolf Parade's songs so unconventional and interesting. Both were given ample time in the spotlight, with the former all erratic jerks, fast-flying words and swinging hair as he took the reins particularly forcefully on "Shine a Light" and "Language City," while Krug foiled him by gracefully poring over his keyboards like a meticulous mad scientist and delivering dramatic lead roles on ""What Did My Lover Say (It Always Had to Go This Way)," "You Are a Runner and I Am My Father's Son" and the climactic set closer "California Dreamer." Thunderous applause (and even a few wolf howls) brought the band back out for a three-song encore that was prefaced by a speech from Boeckner, during which he described the evening's show as the "Platonic ideal" of what they'd had in mind when they first decided to play shows together again. After euphoric renditions of "Dear Sons and Daughters of Hungry Ghosts," "This Heart's On Fire" and "I'll Believe in Anything," no one in attendance could have disagreed. Space and time away from each other have definitely served Wolf Parade well, as they seemed back in sync and sincerely happy to be reunited onstage. And if the rabid crowd's deafening cries of adulation and the giant spontaneous group hug towards the end of "I'll Believe in Anything" were any indication, the band's absence has only made fans' hearts grow fonder.